After Israel Gaffe, Did 10th Dems Organization Turn Their Back on Frerichs Campaign? The North Shore is a crucial battleground area. Mark Kirk did well there and won statewide. Bill Brady fared poorly and lost. The area’s 10th Congressional District always features candidates attempting to outdo each other on pro-Israeli policies. Over the last five months, Frerichs has delivered stinging criticism directed at the office of the Treasurer’s investment portfolio, specifically Illinois’ investment in other states and overseas. Frerichs countered with his own plan of exclusively Illinois investments, although he has not outlined how that plan would work or how it would meet the statutes restricting investments by the office of the Treasurer. One country singled out under Frerichs’ plan: Israel. The office of Treasurer currently has a total of $25 million invested in foreign bonds, all with the country of Israel. 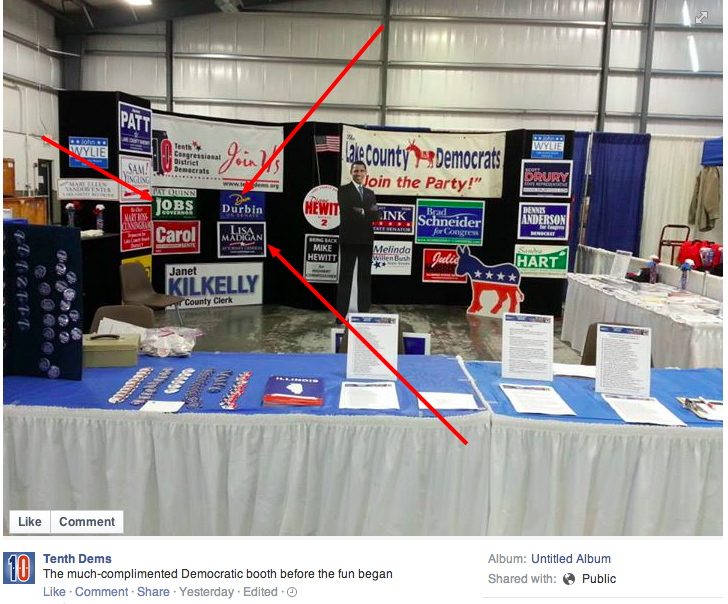 Thus we hardly find it surprising that the 10th Illinois Congressional District Democrats - a group based in that *very* North Shore that aims to "help elect Democrats at all levels of government within Illinois’ 10th Congressional District" - would fail to display a Mike Frerichs for State Treasurer Sign in their booth at the Lake County Fair. Frerichs is notably absent. Think the two events are related? Has all of his support in the North Shore - even within a Democrat organization - dried up?